From the reports coming in from groups, it seems like everybody who visited this year had a great trip. The size of bonefish caught was noticeably larger than previous years with plenty in the 4-6lb range, some crackers in the 8lb range and a couple that were the topic of lengthy discussion as to if they broke the magic 10lb mark. 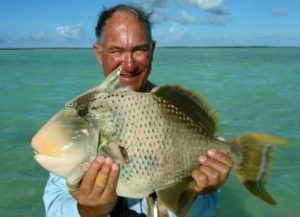 Triggers were again the target of many anglers with stories of memorable captures as well some memorable losses. 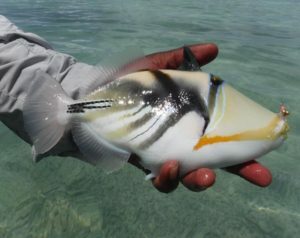 They are certainly a challenging fish to catch but success can be achieved by using the right fly, accurate presentation and a technique that doesn’t spook this fickle species. GT’s were reported to be very spooky with lots of refusals particularly with the larger specimens. Plenty in the 10-20lb range were landed with the largest I heard about, being about the 50lb mark. There were usual tales of the mishaps and breakoffs and, on one occasion, a lost line due to the backing breaking. 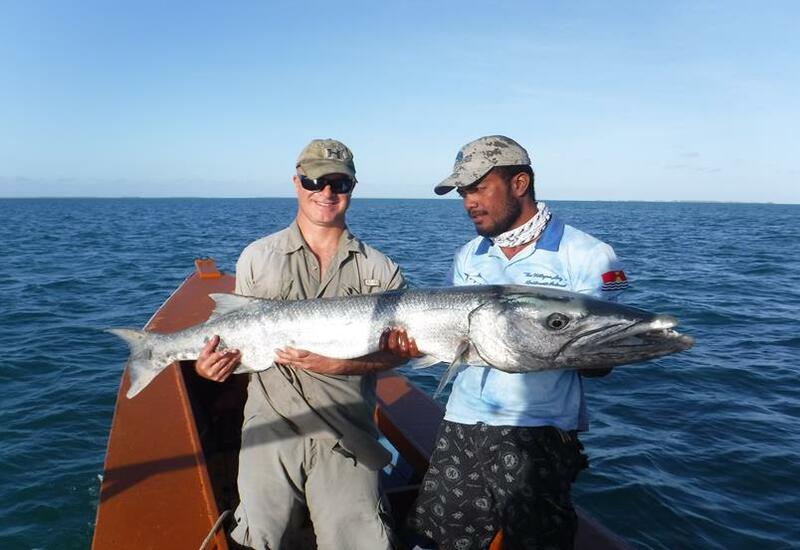 Big GT’s will certainly test your patience, casting skills, tackle and knot tying skills. Unfortunately, no photo but had a report about a specimen of over 30lb that was caught on an 8wt. This is made even more monumental as the story goes that at one stage, the backing was down to about a dozen turns on the reel spool. The expectations of fishermen have increased markedly over the last few years. What was considered adequate service from some of the guides, is no longer adequate. Early finishes and less than fishable locations in the late afternoon are no longer acceptable. The process of improving guiding services has been long and tedious. Some time ago we came to the realisation that teaching old dogs new tricks was not going to work. This is why we have embarked on a program of training some new talent. Another reason for having more guides, apart from replacements due to natural attrition, is that with the growing popularity of the lodge and having large groups of 16-20, it is important that the guides have rest days and time with their families. Three years ago the first group were trained and it is good to see Kim, Menty, Patrick, Ian, Tatoa, Ben and Tootene from that group now receiving good reports. Some of the lesser performing guides have either been or are in the process of being suspended. Lack of interest and not showing up in the morning when rostered are the main reasons for the suspensions. Alcohol consumption still seems to be the main cause of “no shows”. I will take this opportunity to remind everybody not to buy or give beer to the guides. No staff member is allowed to drink on the premises and no guide or boat driver is allowed to drink while working. If they do, the result is immediate suspension. This year another 9 potential new guides underwent training. The selection criteria focused on their enthusiasm, language skills, attitude as well as ability. Two have now joined the roster, 4 are being assessed by the head guide and the remaining 3 are going to have some English lessons before being reassessed. There have been a number of requests to have the services of the same guide for the whole week. 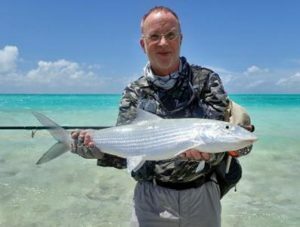 The rotational system has been adopted so that no one person can monopolise well known guides and that way everybody has an equal opportunity to fish with all the guides. Navy Flat has been a popular location for a few of the guides in the late afternoon when conditions were less than favourable. The area adjacent to the flat has no septic system so the water serves as a toilet. 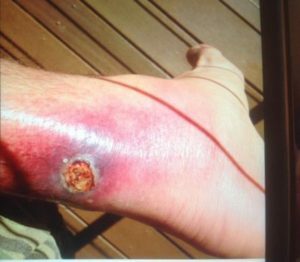 One guest developed a very severe infection contracted after fishing on Navy Flat about twelve months ago and it could have resulted in the amputation of half a leg. The photo should be enough to put you off going there. This flat is now on the banned list. If the boat starts to head towards London late in the afternoon before it heads back to the lodge, inquire about where you are heading. You are at liberty to refuse to go there and get off the boat. Thank you to all those who have donated some cash to help Tanaea after the sudden loss of her husband a couple of weeks ago. She has been an employee of the lodge since it started and has greeted all fishermen with open arms and befriended many people. She has now moved in with her in-laws and they will be a great help to her in caring for and raising her 4 children. Over $3,000 has been raised to date of which $1500 has been transferred to help her with immediate costs. The remainder will be distributed shortly when it all arrives. One of the best news stories this year was that all luggage arrived. Maybe all the representations to Air Fiji has paid off and all issues about weight has been sorted out and baggage handlers have finally got the message. As far as the lodge is concerned, the only major new development is the construction of a separate dining/bar area for other guests staying at the lodge so that they are separated from the day to day activities of the fishermen. The new airport terminal that is due for completion end 2018 seems overly large and expensive for just two flights on one day of the week. It’s aide money that many feel could be better spent by making a smaller building and allocating the remainder to other projects such as improving the quality of the water. There are also supposed to be additional funds to repave the road from the airport to London which is urgent need of repair. With an improved road and consequential increase in speed, I wonder if car accidents will increase as many of the vehicles using the road are not what you would call roadworthy by out standards. The Cabinet Minister, who is an ex-manager of The Villages, called in to share dinner one night and he was saying that they have funding to construct a new hospital probably on slightly higher ground not far from the airport rather than in London again. Another grand plan is the construction of a 5 star resort on the site of the old Captain Cook Hotel and the opening up of a channel from the bathing Lagoon to the main lagoon to give quicker access. It is hard to see how this project would be viable given the limited tourist activities and remote location. Bearing in mind that a similar resort was planned in the Perry’s Wharf area years ago and it had a natural death due to the lack of backers. We also asked him about the rumours that an additional 10,000 people were going to be resettled from Tawara. He said that there were no such plans but there again, he is a politician. We also raised the subject about excessive and illegal netting as well as chumming in the lagoon. He said that he would raise the subject to fisheries to see what they were doing about it. Trip cost for 2019 is $3,150 twin share (excluding airfares) with one guide per angler. Discounts apply for Registered Fishing Clubs making block bookings, stays of 2 weeks or more and fishermen returning for more that 3 times. I arrived on CXI in July this year to be told that the team for the Worlds had been changed after approaches to the Management Board by a number of senior guides. The reasoning was that because of seniority, they should have priority over the younger guides chosen by the Lodge Manager. I believe the real reason was that they thought it would be a chance to get a free holiday to Australia. After representations to the Board with the reasons for the original team selection, they agreed to reverse their decision. The aim behind selecting the young guides is that they would be representing their country, promoting the island as a destination as well as helping to draw attention to the problems they will have if global warming predictions take effect. It will also be a reward for those who have been working hard and receiving good reports from guests. The visit to and competing in the Championships in Tasmania will be a huge experience that they will remember for the rest of their guiding career. The team of 6 as it stands at the moment is Eketi (team captain), Ben, Kim, Menty, Patrick and Tatoa and hopefully, with Kiima to provide assistance with administration for the team as well as the cultural side with singing and dancing. We will be starting some training on the techniques they will be required to master to enable them to compete in an environment that is completely foreign to them. Training will consist of videos and some practical tuition on nymphing and fishing from boats. Also in 2019 we will have to services of a very experienced competition angler to provide some additional tuition when he visits the island. All going well with the fund raising, the schedule will be to arrive in Tasmania on 15 November 2019, under take some practical training until 29 November, participate in the competition until 8 December and return to CXI on 11 December. This will not be a cheap exercise The cost per member will be made up of $2,000 for airfares, $2,500 for entry fees and competition accommodation and $500 for incidentals during the 4 week stay making a total of $5,000 or $30,000 for the full team. We have been fortunate to be offered full sponsorship for one of the team members which is a big help and relieves the pressure slightly making it $25,000 to raise. The team may be trimmed back to 5 if funds raised are not sufficient. I will pay for the cost for our chef, Alfie Kither, as he will be essential support for the team. To enable these guys to make it to Australia we are asking if you would consider being involved in a fund raising effort or by just making a donation to help the team. To assist clubs to become involved, there is a selection of rods, reels and fly lines available to raffle or auction with the proceeds going to the cause. Anyone interested can contact me by email or phone to discuss how you can help. Many, if not all of you, would have at some time fished with the members of the team. This is a time to show appreciation for help they have provided to make our holidays on CXI trips of a lifetime. It may seem like a huge task but when broken down it is not so daunting. If 200 people just donate $100 each we will be there when that total is added to funds already raised. Don’t forget to send a short Email with your contact details so that the donation can be acknowledged by receipt. If the financial target is not reached and the team does not make it to Australia then all monies donated will be refunded in full.